Some years ago when I was doing physical therapy for a bad knee, one of the therapist, a woman who talked in yells, said (yelled) to me, "SUSAN, THE DIFFERENCE BETWEEN YOU AND ME IS THAT YOU LIVE IN FEAR!" Fair enough, and one of the things I really fear is grilling. That cute little table-top Weber I bought 2? 3? years ago did get out of the box and that was it. I fear the trouble — the mess, the time, the fire and charcoal. 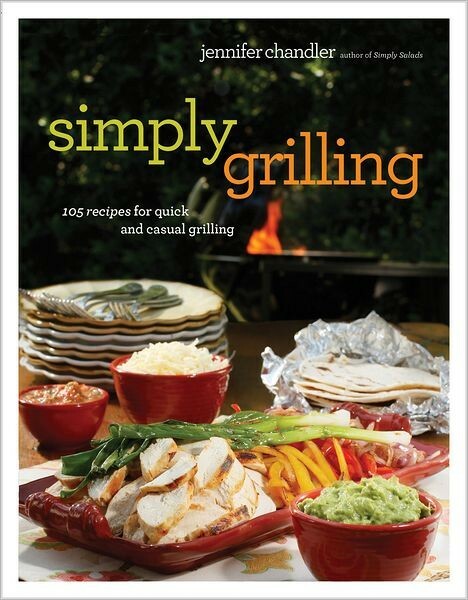 All of this to say that I really appreciate Jennifer Chandler's Simply Grilling, the third in her "Simply" series. She signs the book tonight, Thursday, April 26th, at the Booksellers at Laurelwood at 6 p.m.
My friend and I talk a lot about food. 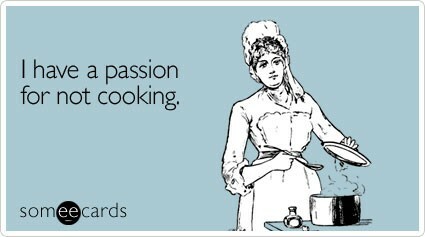 Much of it revolves around cooking. About a year ago, I started noticing a conversational quirk that keeps popping up. The scenario: She's talking about something she's cooking, asks what I've been making, then, before I reply, says, "Oh, that's right. You're never cooking again." For the record, I have never said this. Nor have I even thought it. Realistically, it doesn't even seem possible. And, so what? So what if I never cook again? 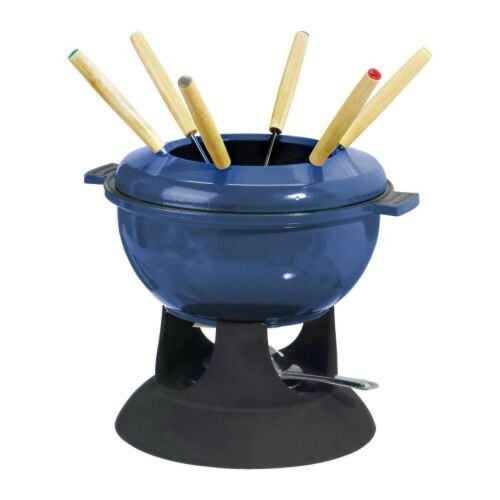 That was my response to coworker Michael who was telling about his new fondue set. A meal at the Melting Pot had inspired the purchase, and he was looking forward to breaking it in. Like I said, hot pink — though it started out as purple cauliflower. This is Cauliflower Ceviche, a recipe I was intrigued by from the moment I saw it on the Clandestino website. The cauliflower turned pink immediately upon hitting the lime juice. 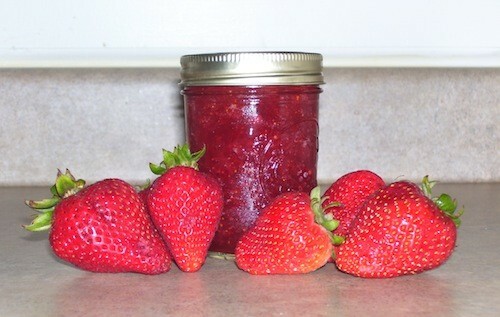 As for the taste ... most notably it's tart, and I will say that a little bit goes a long way. Say what you will about the egg-milk-bread snatching grocery-store stormers, they no doubt are eating better than I am. I've got rice, spaghetti, ancient corn flakes and miso soup mix, a can of baby corn, chili garlic sauce, a can of olives, vinegar, several cans of diced mild chiles, and one small can of pineapple juice. Unsurprisingly, the results from recipematcher.com: "Sorry there were no matches." In the issue hitting the stands tomorrow is a feature on Grits & Eggs dish created by Justin Fox Burks. While it's not unusual for grocery stores produce departments to sell pre-prepped shish kabobs and stew mixes, it does seem that Whole Foods has been upping the ante lately. In addition to items mentioned above, the market now has large bins with pre-cut onions, peppers, broccoli, as well as a potato and leek soup mix (pictured at top). Buying this sort of thing has always struck me as expensive and a mark of someone too lazy to use a knife. I have to say, though, the Thai Stir Fry Mix has changed my mind. Since I'm not much of a joiner anyway, I tossed contents of the envelope, except for this bowl scraper. One of the great abominations for foodies is the non-essential one-function tool, but as you can clearly see the Cooking Club of America cleverly sidesteps this. This bowl scraper not only scrapes bowls, it measure pasta. Coming Clean: What Is This? This, however, I will easily toss, because I can't remember what it went with and I'm not exactly sure what it does. Frankly, I can't positively say you cook with it. It's some sort of filter, I guess, and it has a dial that can be set, mysteriously to either J, F, M, A, M, J, J, A, S, O, N, or D.
What is it? Is it vital?